Lindsay grabbed Katie’s arm as she pulled out a box of ammunition from the supply closet. Shaking it off, Katie pried the metal box open and knelt to begin reloading her empty magazines. Have to go. Have to go. Taking too long. Hurry, Katie! She fumbled with a .22LR round and instead of snapping it into place, it slipped out of her hand and skittered across the floor to roll beneath the dresser. Her vision swam as she moved to reach for it and her eyes felt so heavy she could hardly keep them open. “Get me a 5 Hour Energy,” she said, reaching her hand beneath the dresser to feel for the round. She could have just gotten another one from the box but wasting ammunition felt wrong. She had to get this one. It was very important to her for some reason. “Katie, please! Stop it. You’re barely staying awake,” Lindsay said, kneeling beside her. Katie felt her friend’s hand touch her arm again and she reached further beneath the dresser to dislodge it once more. Irritation flared to sudden anger as the round slipped away from her fingers and rolled against the wall. Withdrawing her arm, she flailed, slapping away Lindsay’s hand. Dizziness overcame her and she stumbled, then fell over. For a moment, there was only vast darkness. Was she dead? Had she been bitten after all? But no, no there was Lindsay again, her hands on her, drawing her up. Warm arms went around her and held her tight. She was just so tired. “Shh,” Lindsay whispered into her ear. Katie wanted to push her away, to stand up and grab her rifle, but there was no strength left in her. Her wound from before felt fine but so much of her strength was gone. She was weak and exhausted. Just opening her eyes was a chore. Katie realized that Lindsay was crying. They both were and she turned just enough to hug her friend in return. What if her dad didn’t come back? What if he was hurt out there and she couldn’t get to him? She’d be letting him down. She’d be letting him die. I’d be alone, she thought. Her dreams were filled with images of suffocation. She was curled inside of a box buried deep in the earth, the weight of a mountain crushing her to death. She struggled for breath, struggled to stretch out, struggled to live. In the end she woke with a start, a gentle weight around her middle. She panicked until she realized it was just Lindsay’s arm curled around her waist. She was laying on her cot, Lindsay snuggled against her back and clutching tightly to her. Rubbing the sleep from her eyes, Katie struggled to banish the last thoughts of crushing confinement from her mind. Why had she dreamed of boxes? Of buried boxes of all things? She had no fear of confined spaces normally. She sat up so quickly that she nearly hit her head on the bunk above her. Lindsay started awake with a snort and groan. Swinging her legs out of the cot, Katie quickly found her boots and slipped them on. “What time is it?” Lindsay said, still groggy. Katie didn’t answer, but instead looked around the room for her dad before moving into the other compartments. “Dad!” she shouted over and over, but when only deafening silence answered her, she returned to the bedroom. Putting on her coat, she found her rifle and began to reload its magazines. This time, her hands were steady, even though a cold fear threatened to shake her to her core. Katie jumped to her feet and ran into the supply room. She ripped open the drawer containing the maps and rifled through them, fingers fumbling with giddy anticipation until she found the one she was looking for. It was an old map, black and white with lined topography. “Like last night,” Lindsay said. Katie spread the map open on top of the shelving unit and found the location of the bunker. It was outlined as a triangle in red marker. Then, tracing her finger north and west towards the town, she measured out about three miles, then started looking north. Her finger ran straight into one of her dad’s buried caches. Her heart leapt and she found herself smiling. “I’m coming with you,” Lindsay said, her voice quiet but firm behind her. “No, you’re not.” Katie grabbed the map and brushed passed her. Moving into the living room, she checked the monitors to make sure the area around the entrance was clear. So far, so good. “Once!” Katie said, feeling her irritation and anger rise again. This wasn’t a time for arguments! This was her dad’s life! “Please, Katie, I don’t want to be useless anymore.” Lindsay’s voice broke as she said it. There was something there, something more than words being conveyed. A memory flashed of two years ago, when Lindsay said the same thing. Her father had thrown Linday’s report card at her and told her that she better shape up, like her brother. He was going to Johns Hopkins for Pre-Med. He wasn’t a failure. He wasn’t useless. Katie had been there. How could she forget that? “You’re not,” Katie said, her tone softening. Digging into her pocket, she drew out the paper her dad recovered from the shelter beneath the school and handed it to Lindsay. Lindsay looked at the number written on it for a long moment and licked her lips. “Lin,” Katie said, her voice very quiet. She looked into her friend’s eyes and held them. “I need to do this. I need you to be here, to be safe. If something happened to you I’d…” In that moment, she realized how much she meant that. I’d never forgive myself. Katie reached out and pulled her into a tight hug, squeezing her friend desperately close. She didn’t want this to be a goodbye. It wouldn’t be. She’d find her dad and they’d get back here. No problem. 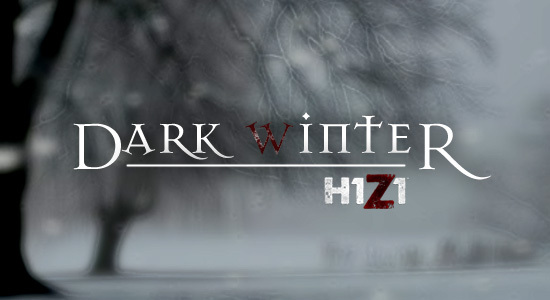 This entry was posted in Dark Winter, Fan Fiction and tagged blog fiction, Dark Winter, Fan Fiction, H1Z1, Mike Kern, SOE, Zombie Apocalypse. Bookmark the permalink.